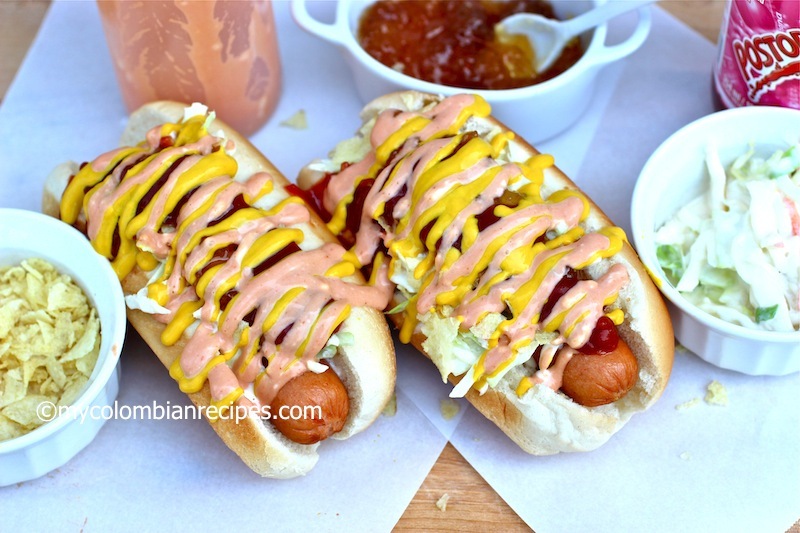 Colombian-Style Hot Dogs is one of those recipes that I really enjoyed preparing. There are a lot of things that I miss about my country, but the three that I miss the most are my family, my friends and the food. 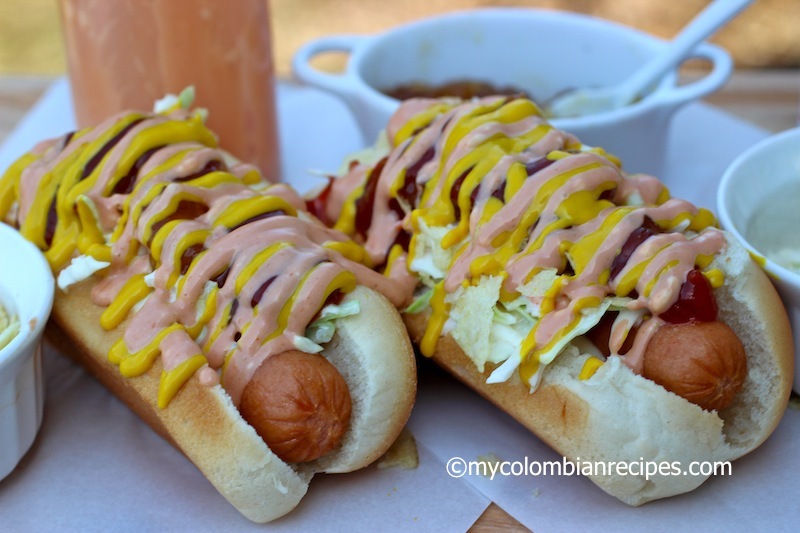 Medellin, like other cities in the world, has hot dogs stands on the streets and this recipe is very popular with them. 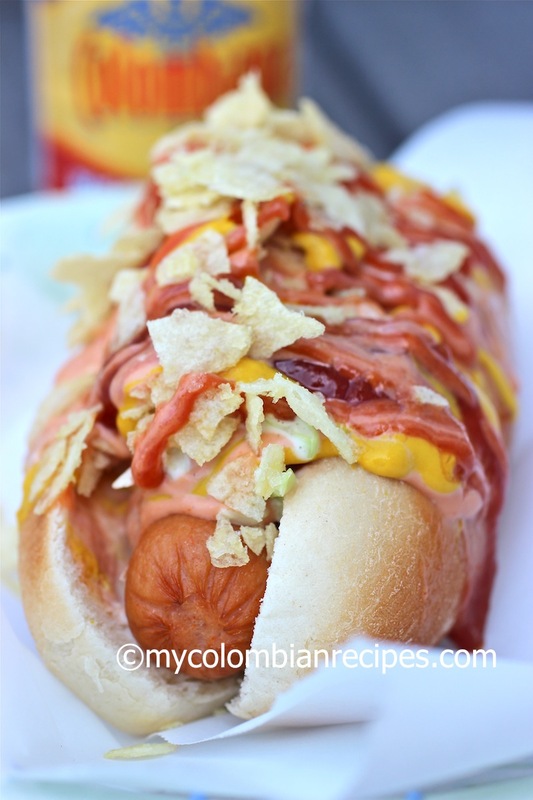 In Colombia we don’t grill the hotdogs or salchichas, we boil them and the toppings include coleslaw, pineapple sauce, ketchup, mayonnaise, mustard and potato chips. When my friends and I would go out to dance, we would usually end up at one of the best hot dog stands located on Poblado Avenue in Medellin at 2 o’ clock in the morning. I really miss those times. If you are a vegetarian, like my husband, you can buy veggie dogs and use the same toppings. I made them for him and he absolutely loved them. I hope all of you have a great 4th of July weekend. Put the pineapple and water in a blender and blend until smooth. Press the pineapple mixture through a sieve into a small saucepan. Discard the pineapple on the sieve. Place the saucepan with the pineapple mixture over medium-low heat and add the lime juice and sugar. Cook, stirring for about 15 minutes. 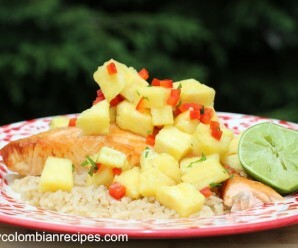 In a small bowl blend the cornstarch with 1 tablespoon of water and then stir the mixture into the pineapple sauce. Bring slowly to a boil, stirring until the sauce thickens. Simmer gently for 4 minutes while stirring. Let it cool and transfer to a serving bowl. In a medium pot bring water to a boil. Add the hot dogs to the boiling water and cover. Cook about 7 minutes. Place the hot dogs in the buns and top with pineapple sauce, coleslaw, mayonnaise, mustard and ketchup, topped with crushed potato chips. Serve and enjoy! These hot dogs are absolutely delicious! I love the crushed potato chips! We prefer our ‘dogs boiled as well but I’m pretty boring about what I put on it – just ketchup or mustard. The pineapple sauce sounds really intriguing but it’s great to see that you also put coleslaw. In North Carolina, coleslaw is a preferred topping for hamburgers – now, I’ve got to try it with hot dogs! In Colombia we put coleslaw on our hamburgers too. Simply put–my hero. 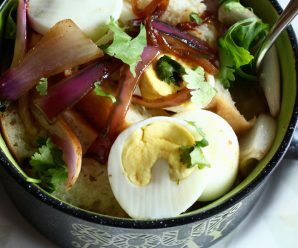 These are the recipes you can not find in the cookbooks from Colombia. I cant wait to show my husband. He will be licking his chops. I would LOVE to see the recipe for the hamburgers like the one I ate in Cali…the corn on the cob that you buy on the street…and my FAV Cholao 🙂 You too have a great 4th! Looks perfect for the holiday weekend. I’ve never thought of pineapple on a hot dog before, but I bet it’s good. Thanks for sharing..
I’ve also seen this with mozzarella cheese? Pineapple sauce on a hot dog! That is really unique and creative. I bet it’s a great blend of sweet and savory. I love how different and fantastically delicious your food is! Sounds so good. I love your site. Very interesting and informative. I am sure my husband will enjoy this recipe! I would love to try these fabulous hot dogs with pineapple sauce! Yum! Looks tasty ! and Delicious pinapple Yumm! Join and Post your comments! Thank you, thank you for the wonderful comments! Thanks for visiting my blog; glad you liked the squash soup recipe. This hotdog is mouth watering! Actually after going salsa dancing, I usually crave some food, and this would definitely satisfy! yummmmyyyy:) in cali we add bacon and mozarella cheese. OH. My. Gosh! Pineapple on my hot dog! That is brilliant! I just happened to buy some sausages the other day, so I’ll definitely be giving this recipe a try! No doubt it is absolutely delicious! Thanks for sharing! This reminds me of a West Virginia hot dog. In certain parts of the state, the perfect dog requires a steamed bun, boiled dog, topped with a chili sauce of finely ground meat, and then a finely chopped and creamy slaw. Now that’s a recipe I never thought I would see online, or anywhere for that matter. I completely forgot about the pineapple sauce and the crushed potato chips. It’s like being on a street corner in Bucaramanga or Bogota again. 30 years ago I lived with a host family in Bogota where the matriarch was convinced that hot dogs were made from stray cats (and then there were the pinchos…), so I just stopped telling her what I had for lunch. Thanks for the nice recipe, Erica. It seems to be very delicious, according to the images. I remember having some dogs out in Belem in Medellin with all these ingredients, and as the guy said up top, a big slab of mozzarella covering it…wow they were killer! 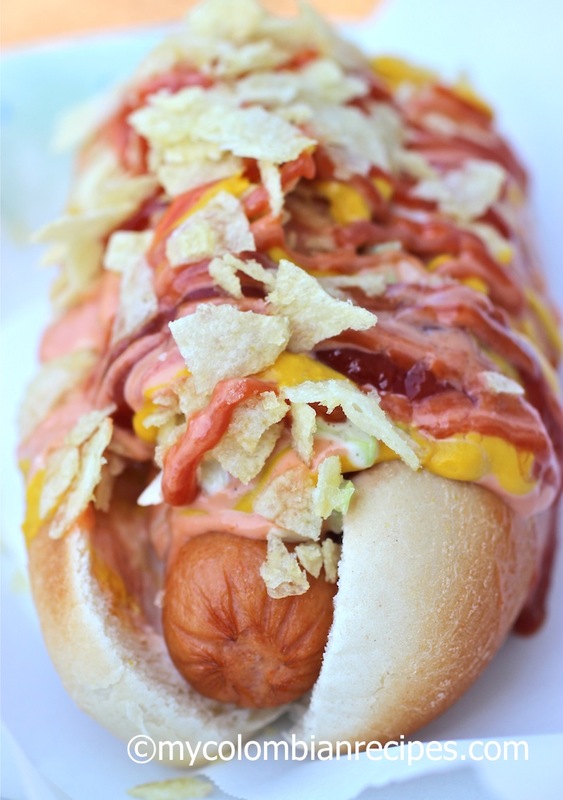 There is a place that puts bacon on there hot dog here in Colombia..its great with the cheese, pineapple, and the chips…. I love Colombian hot dogs. I am so excited to have found your site! My husband is from Bogota, Colombia and we have 2 children ( a girl 4 and a boy 1). I want to be able to cook good traditional Colombian food for them from time to time. Pedro has spoken of the “perro calientes” from the street vendors. Cant wait to make this for him and your mom’s tamales too! NO LO PUEDO CREER!!!! POR FIN!!!! Thank you. I cannot wait to make the hot dogs. For me, being from Cali, it was the perros de la 44. My mouth is watering just thinking about having one (or two) with Coca Cola. I made this on Saturday, and I actually could not stop eating it. Sabes? yo juraba que no era mayonesa sino alguna otra salsa que no se conseguia aqui. Yo vivo en Long Island NY y de vez en cuando manejamos una hora solo para comer perros en un sitio Colombiano en Queens…. lol… que aficion. Voy a ensayar los tuyos, asi puedo comer mas seguido. I made these for my Easter party today and everyone loved them. Thank you so much for your recipes. I really miss Colombian hotdogs. But I think they are better with chuncks of pinapple and not just the sauce, the way we eat them in Bogota. We also don’t add coleslaw and use chopped onions. We made these hot dogs yesterday for some friends and they loved them. Different and delicious. wow.. it is nice.. it must be deslisious. I’ll try..
We made these last sunday and they were a hit. 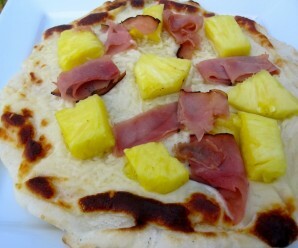 Thank you….delicious with that pineapple sauce. NO SOY MUY FANATICA DEL PERRO CALIENTE. PERO ESTE ME FASCINA , ME ENCANTA. 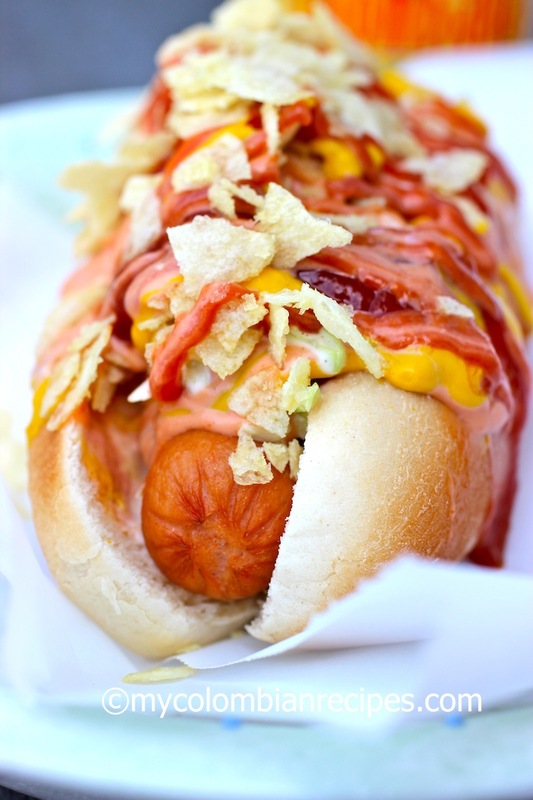 the colombian hot dog, outstands because of the variety of flavors. pineapple is one of the flavor that satnd out , in combination with ketchp and mayonise, also another topic that makes it unique its a crunchy chips on top,some people often put cheese as well and bacon. depending on the size the hot dog may include small pieces of boil eggs. so delicious!!!! I just made these for dinner and they were so good, I had two of them! I had made these in the past but totally forgot about adding the cole slaw which gives it a really nice touch. Yes, the hot dogs you get in Medellín will come with cornish hen eggs but if you don’t add those, that’s totally fine. I did use pineapple jam instead of making my own sauce and store bought cole slaw (KFC to be exact), it is just too much work to make those and it’s easier and faster to have them on hand to make these hot dogs. Thanks Erica! Thanks for the hot dog recipe. I’m gonna try this out and see if the folks around here like it. i am actually here in colombia right now, barranquilla, te be exact. And they dont put mayo, mustard, or ketchup. Instead, they put salsa tartara, salsa piña, and salsa rosada (which is ketchup and mayo already mixed together). Also, the coleslaw, which they call verdura, costeño cheese, and the potato chips. Of course, it can get as extravagant as you can imagine when you ask for something like a suiza or a hayawano . Ahhh you know how to make the salsa de pina que se le pone a los perros!! You’re amazing!! Yo no soy muy fanatica de los perros pero si me encantan las hamburguesas colombianas! Ahora por fin tengo la receta de la salsa de pina. Que rico! Gracias!! Que verguenza! Hasta ahora estoy viendo este articulo. Los perros son deliciosos pero no como cualquier perro. Solo las salchichas Americanas. Uy, riquisimas. Pero una cosa, veo que dices que tiene cole slaw. Umm..pues depende donde se los compre. Es que soy sureña (de Charlotte, Carolina del Norte) y cuando vino mis papas para visitarnos ella hizo “southern cole slaw” y mi esposo no sabia que era. Le gusto pero fue diferente nunca lo habia probado. Lo habia visto (y yo tambien) una vez en un restaurante pero se llama “ensalada”. Y se encuentra muy rara vez. De pronto en Medellin o otro lugar si, pero aca en Bogotá no. Mas se ve la salsa piña, salsa roja, mayonesa, papas y huevos. Hasta en los cines sirven perros calientes con condimentos de la linea Fruco (piña, salsa roja, mayonesa, salsa de tomate). 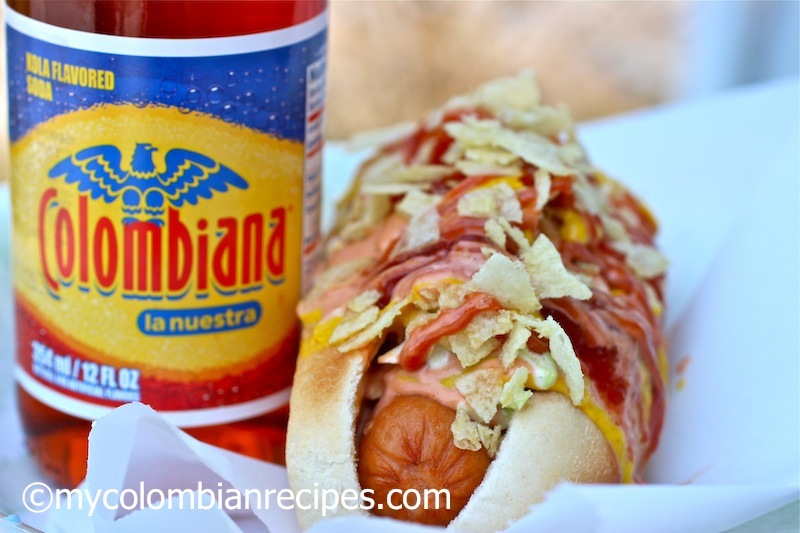 Mmmm colombian hotdog sounds wonderful! yum yum! made these for my wife and our colombian friends and they went nuts,thank you for such a great website. Had these superb dogs all over Cartagena 30 years ago. Does anyone know what type of mayonaise is used? What ingredients are in the mayonesa? Brand name? After the third dog I had this unique taste imprinted on my tastebuds forever and I would like to reinvent that taste. Loved Columbia and the people. que ricos! i have these in miami all the time, they are definitely great late-night after dancing! Mi familia aqui en USA piensan que estoy loca con esta combinacion, pero lo mismo yo pensaba de su “peanut butter & jelly” jaja. Despues de rumbiar yo tambien comia estos ricos perros calientes en mi linda Cali. Mmm brings back memories…love the salty and sweet contrast of flavors. 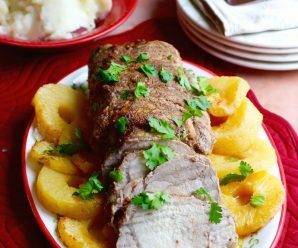 el mes entrante mi bebita cumple un año y no hago sino pensar en la fiesta… probablemente la harè por la tarde y estaba pensando en hacer unos pasabocas y como “plato fuerte” perros calientes, tenia solo un problema: vivo en Italia y acà no se consigue la mermelada de piña, pero con esta receta acabas de salvar mi idea!! Una pregunta: que es “cornstarch”? maizena? A mis amigos italianos les va a encantar pero antes de probar seguramente me van a decir que eso les hace daño…LOL!!! Marcela- Es “Maizena” y Buena Suerte con tu fiesta. Recetas Colombianas en ingles. Fantastico….A mi me encanta la comida Colombiana. Hola! buena página. Una consulta. I LOVE these! I live near Jackson Heights in Queens, New York City, where we have a huge Colombian population. We are blessed with incredible arepas, empanadas (these are the BEST http://www.mamasempanadas.com/), cholados, and of course, perros calientes. If you ever get homesick, Jackson Heights, Queens is possibly a great place to visit to get a taste of Colombia without a passport. My boyfriend and I actually taste tested two top places for perros (http://www.seriouseats.com/2010/02/colombian-hot-dogs-perro-caliente-queens-jackson-heights-nyc.html) (among many), and he was a huge fan. He also loves bunuelos and Colombian roasted chicken (http://www.yelp.com/biz/pollos-a-la-brasa-mario-jackson-heights). We’ll definitely have to try this recipe, thank you for sharing! I’ve had this recipe pinned forever already and I’m finally going to make them this weekend for Father’s Day. I’m so excited! I’m wondering…Did you mix the ketchup and mayo together? Looks like that might be the case in a few of the pics. I’ve never had them before and I want to make sure I get it right! I really like your blog, btw. Everything looks so good. Lots I want to try. It’s hard to find recipes like the ones you share, so thank you! You definitely need the bioled quail eggs on top! That’s like the cherry on top! I usually put two quail eggs cut in half ( pink sauce + quail eggs = magic). Which sausage brand do you recommend the most? I know this is a very old post, but I would love to know the name and location of your favorite hot dog stand in El Poblado. Currently staying here though the sixth of Jan and would very much like to try one! Thank you and here’s hoping that I hear back from you! My last time visiting a hot dog stand in Medellín was in 2000. Es la 1:48 a.m. en Shanghai, muero del hambre de solo ver estás fotos, justo hoy pensaba en las deliciosas PERRAS qué venden en Envigado, el mismo perro pero con MUCHA TOCINETA (Bacon) imposible ver nuestra Fast Food en otros lugares. Este fin de semana, quiero Hot Dog, perrito caliente, leyendo me hiciste acordar de los cebolludos de la 10. Qué maravilla, mis preferidos, Tomate – Cebolla y todo lo demás…. Y ni hablar de las delicias (Qué siempre odiaba allá) de Dogger……… es el mejor invento de la historia, Perros Calientes Buffet. Uno de mis sueños acá es tener un Latin Fast Food Truck, vendiendo Arepitas Rellenas, Patacones, Perros y Hamburguesas en nuestra manera latina. Gracias por el blog me encanta, yo tengo mis “versiones” Veggies, me gustaría pasartelas, igual las escribiré en mi nuevo Blog, qué delicia todo esto. So good. My family loved it. What is the pink sauce on the hot dog?